Teacher professional development workshops run in conjunction with science meetings offers educators and scientists a unique opportunity to learn from one another. 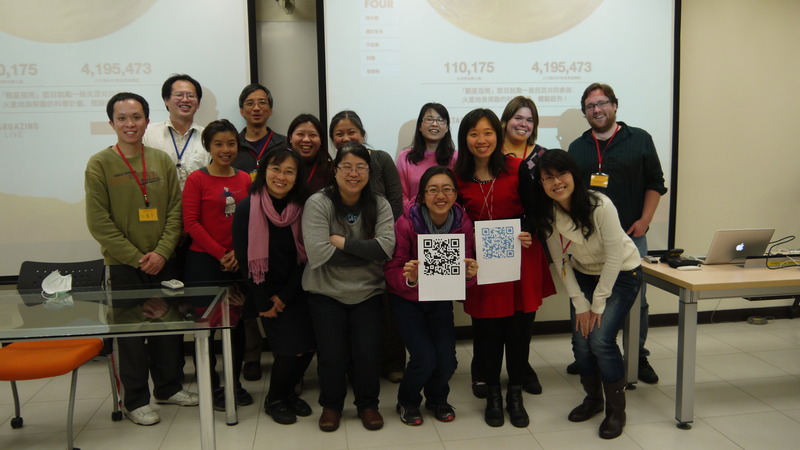 On Sunday March 2, 2014 the Taiwan Teachers Workshop was held as part of the Citizen Science in Astronomy Workshop at the Institute of Astronomy and Astrophysics at Academia Sinica in Taipei. The Citizen Science in Astronomy Workshop brought together astronomers, data scientists, and web developers together to discuss the challenges of working with large datasets and best practices in utilizing the power of citizen science to work with these datasets. Recognizing an opportunity to bring Zooniverse project scientists together with area educators, Meg Schwamb, Stuart Lynn, Lauren Huang and Mei-Yin Chou worked with teachers to introduce concepts of citizen science with special focus on Planet Four and Galaxy Zoo. Earlier this year these two projects were translated into Traditional Chinese as part of Zooniverse’s push to translate various projects into as many languages as possible through the efforts of our extensive volunteer community. To add to this translation effort, a number of existing Zooniverse educator resources were also translated into Traditional Chinese including Planet Four & Galaxy Zoo lesson plans and Galaxy Zoo teacher and student guides. You can find the workshop presentations and links to the translated educational materials at http://taiwan.zooteach.org/. Funding for the Taiwan Teachers Workshop was generously provided by Taiwan’s Ministry of Science and Technology. Kat is sharing her impressions of Galaxy Zoo and Radio Galaxy Zoo as the fifth post in our Thoughts From the Classroom series. My name is Kat and I attend a school called GATE Academy. Let me tell you a story about my experience with Galaxy Zoo. Two months ago, my teacher discovered Galaxy Zoo. She thought it would be a good class activity, so she had us read some articles as background information for what we were about to be doing on Galaxy Zoo. These articles included information about the different characteristics of the different galaxy types and how this galactic information ties into the evolution of our Universe. It hadn’t occurred to me before that galaxies tie into the Universe as a whole, but it made sense once I read it and I thought it was fascinating. Then we started actually classifying galaxies as our class assignment. In retrospect, I should have been amazed and acknowledged how incredible looking at these far-off galaxies was, but I just didn’t see it at the time. I overlooked it because my mind was set on it being a class assignment and how I just needed to do it to get a good grade. When I started, all that came up on my screen were pictures of blobs of clumpy blurry things. I wasn’t very impressed. Everyone around me, though, started seeing beautiful, wonderful images of incredible galaxies. This is when I understood what a privilege it was to be participating in this new, cutting edge, amazing research. On my screen showed actual galaxies from outer space. It struck me how little we know about the universe around us, because nobody really knows what’s out there. We have hypotheses, but, honestly, anything could be out there. I became proud of the blobs I classified, because you really needed to look and observe the characteristics, unlike perfect, sharp, clear galaxies (but these were really quite beautiful). There was more mystery in the blobs for me, so classifying them correctly (or as close as I could get) became my challenge. I learned a lot about classifying these galaxies along the way. The Zooniverse taught me about how galaxies can be spiral, irregular, or smooth, with bars, clumps, and varying sizes of central bulges. I learned about how black holes are visible in radio telescopes but not in infrared. I also learned the different types of black holes, such as compact, extended, and multiple. After seven weeks of classifying these galaxies, my classmates and I had classified over 9,000 galaxies. We were all proud of our accomplishment and of all we had learned along the way. I definitely recommend you at least try classifying on Galaxy Zoo, whether its galaxies or black holes or what have you. Why not? Don’t you want to say you’ve had the experience? Would you like to contribute to our knowledge of the universe, or even do your OWN original research about the wonders around us? If you have any of those interests, or just want to check it out because it sounds cool (and trust me, it is), definitely go to Galaxy Zoo and start classifying. This fourth post in our Thoughts From the Classroom series comes from Riley and Harrision. Riley and Harrison are 8th grade students at Gate Academy and are both Galaxy Zoo volunteers. Galaxy Zoo is a great program. It was brought to my attention when we began using Galaxy Zoo in class. It was extremely interesting because I had never seen pictures of our universe like the ones I am able to see on Galaxy Zoo. On one picture, we found an amazing spiral galaxy with such a huge level of clarity, you could even see individual stars. It just blew me away. Galaxy Zoo is enlightening about the true scale and beauty of our universe. In the background of these immense galaxies you can see dozens of smaller galaxies, which are really just as huge as the one you’re getting a close up of. How cool is that? The structures are so massive but detailed down to the tiniest level, as demonstrated on Earth. I think that everyone should give themselves a chance to appreciate our Universe. Galaxy Zoo really provided me with food for thought, and I recommend it strongly to anyone with the vaguest curiosity about what’s up there. I’m Harrison, and I used Galaxy Zoo in my middle school class. We instantly loved it because, it’s the perfect combination of learning about the different types of galaxies and having fun while doing it. Using Galaxy Zoo also gives you a feeling of helping scientific research, by helping progress our scientific understanding of the Universe. The website is user friendly allowing you to classify galaxies, check your personal account, and see other information with a click of a button. The website is interactive and awesome showing you breath-taking pictures that you get to classify. There is so much to do and you can easily be lost for hours. I would recommend Galaxy Zoo to anyone. For a long time we’ve tried to translate Zooniverse projects and this has often worked out very well. When we have done it, we have definitely seen the benefits. For example, we know that Polish classifiers on Galaxy Zoo did more classifications per-person than their English-speaking counterparts in 2011. About 8% of all our classifications are completed by people using our websites in a language other than English. We think that number should be higher. In the last year we’ve launched Galaxy Zoo in Spanish, Traditional and Simplified Mandarin, and Italian. Planet Four is also available in Traditional Mandarin. Plankton Portal is available in Polish and French. Planet Hunters is also available in Polish, and Snapshot Serengeti is in Polish and Finnish. Finally, Whale FM is available in Polish, German and Whale. This has all been possible because of the hard work of colleagues and translators all around the world. We’re currently working on a place to credit them for their efforts so you know who’s been making this magic happen. Particular thanks should also go to Chris Snyder and Michael Parrish, at Zooniverse’s Chicago HQ, for their efforts in making our sites and infrastructure better at handing multiple languages. …and more are being added all the time. If you’re interested in helping out, please email me on rob@zooniverse.org and let me know your Zooniverse username and the language, and project(s) you’re interested in translating. We hope to bring you updates soon. In the second installment of Thoughts From the Classroom, we hear from Jack & Brendan two of Victoria’s 8th grade students from Gate Academy in San, Rafael, California. We asked them to tell us about their experience using Galaxy Zoo and Radio Galaxy Zoo in the classroom. Hello my name is Jack and I go to Gate Academy in San Rafael, California. My classmates and I have been using Zooniverse websites, mainly Galaxy Zoo, to help us with our studies. Our class has benefited greatly from using Zooniverse websites. Galaxy Zoo is a great site and has taught me a lot about galaxies. I went from knowing next to nothing about classifying galaxies to being able to identify a spiral or bar at only a single glance. Galaxy Zoo helped our class learn about different kinds of galaxies and how to tell if it is disturbed, or even if it has a lens or arc. If my class had not experienced Galaxy Zoo, we would all know a lot less about galaxies. If you are a teacher and you want your students to learn about galaxies, Galaxy Zoo is a wonderful site. I would put it at the top of my suggestion list. I hope people everywhere use this site, and that they all like it as much as I do. My name is Brandon and I’m a middle school student at GATE Academy, San Rafael. I love soccer and programming. I want to tell a little more about my experiences with Galaxy Zoo, and its uses as an educational tool. While using Galaxy Zoo, I had a chance to learn a lot while also contributing to the Zooniverse project. For instance, black holes show up on radio telescopes but not infrared, although sometimes associated galaxies can show up on the infrared near the black hole. I learned this from Radio Galaxy Zoo, the part of Galaxy Zoo that focuses on finding black holes. While I was learning about radio telescopes and black hole jets, I realized that I was also helping add to the reserves of information that scientists can draw on during their work. Overall, I think that Galaxy Zoo can really help students learn and also helps advance science. My time with Galaxy Zoo has shown me what a wonderful universe we live in and taught me a lot in the process. I think other students should have a chance to have that experience too. Thoughts from the Classroom: Thinking of using Galaxy Zoo in your middle school classroom? Do it! Today’s post comes from Victoria Talkington and kicks of a short series called Thoughts from the Classroom. Victoria is a middle school teacher at GATE Academy. She and her students recently dove head first into the Zooniverse with Galaxy Zoo by completing over 9,000 classifications (many thanks from the science team)! Victoria’s students also contacted Galaxy Zoo scientists and developers with their questions. In today’s post Victoria tells about why she chose to bring Galaxy Zoo into her classroom. In the coming weeks we’ll also share some her students’ impressions of participating in an online citizen science project as part of the Thoughts from the Classroom series. Here at Zooniverse we thought is was about time we started listening directly to student perspectives on our projects. I chose Galaxy Zoo for my middle school class because it’s real science. It’s hands-on, minds on science, with the thrill of possible discovery. Galaxy Zoo may seem, to the uninitiated, to be an addictive, time-sink fantasy game, with pretty pictures of dust lanes, swirling gases, and spiral galaxies. In fact, it is the ultimate cosmology reality show. Galaxy Zoo packages community involvement, cutting edge research, and classification skills, and draws kids in to a place where they are DOING something meaningful and genuine for all the world. I’m an educator at GATE Academy, a school for academically gifted kids in Northern California. My BA at Yale was in molecular biophysics and biochemistry, back in the late 1970’s when biotech was in its infancy. After a stint at Harvard Law School for my JD, followed by a long career as a trial attorney, and then a decade of volunteer service in complex, multi-party administration arenas, I started my fourth career in education. With the internet and handheld devices making content oh-so-cheap, I realized that education has fundamentally changed. Learning about the stars is not enough. Kids need chances to do something valuable in the world. The challenge that science faces today in attracting enthusiastic kids is that we’ve travelled so far. What happens in labs and research is simultaneously too rarified and too granular to grab a young mind. There’s too much start up time involved, and the details of the periodic table can seem remarkably dull when there’s MindCraft to play after school. Galaxy Zoo cuts to the chase and ignites in kids an understanding that there is excitement and discovery out there beyond the pixels of fantasy software. Galaxy Zoo teaches that everything hasn’t been discovered – there are still galaxies to hunt. Kids can be Captain Kirk traveling on the Starship Enterprise, for real. They can go where no human has gone before, looking at distant images, trying to understand what they are, and keeping their own captain’s log of their observations — or simply rely on the strong, slick classification tools of Galaxy Zoo. Galaxy Zoo enables kids to discover how the hard work of real science opens their minds, and makes them curious about their world. If I were to suggest starting your a class on Galaxy Zoo, I’d have the kids dive right into classifying with only minimal introduction. And you know, what they are doing will be puzzling and it won’t make too much sense to them at first. So, they will start asking questions. List their questions on a board, but don’t answer them. Maybe they won’t see the point. You’ll be able to suggest that they look at the Galaxy Zoo “Story” for homework. They’ll read it — and a couple of kids will “get” what the adventure is. You can talk together about it at the next class– what do the kids think they are doing? Guide them into understanding that they are helping to figure out how galaxies form, and that this thing, this task that they are involved in, is how true discovery and scientific work takes place – image by image, galaxy by galaxy, categorization by categorization. How many classifications do they think they can achieve over the duration of your term? Set a goal. And gently, as your kids become more and more engrossed in Galaxy Zoo classifying, you can start introducing readings on galaxies. Little current news items from, say Scientific American or Science News. Somehow, suddenly, what would have been dry content for most of the class, greeted by groans or (worse), becomes material that most of them are interested in. They might even start doing Galaxy Zoo classifications at home . . . instead of MineCraft. Who knows? A new Captain Kirk might be discovered in your classroom. Teaching for the stars.